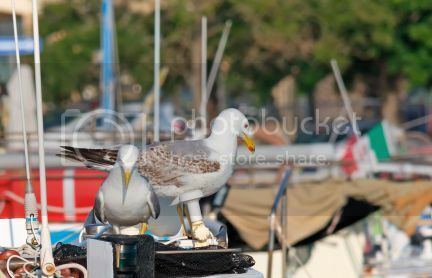 Bird spikes are great for keeping birds away from the ledges and edges of your boat, where they like to roost and eat. Bird Spikes are not designed to harm birds. They simply create an uneven surface making it impossible for large birds to land. Spikes are available in plastic or stainless steel and can be purchased in six foot, 20 foot and 50 foot boxes. There are several width options depending on the width of the area needing coverage. The Repeller 360° spins in the wind to prevent large birds such as gulls, pigeons and crows from landing in unwanted areas. The unit has a six inch diameter and is ideal for boats and docks. The Repeller 360° is made of stainless steel arms attached to a UV protected polycarbonate base. At the end of each "arm" attached to the top of the Repeller is a reflective "predator eye". The spinning motion and reflective predator eye will work to scare birds and prevent birds from landing in treated areas. Visual deterrents are ideal for large and small birds. Visual bird deterrents can be placed in various areas around the boat, dock or boat house to scare small birds away from the area. A scare eye balloon and red flash tape are great options to keep birds away. These products can be used alone or in combination with other products. Don’t return to a bird poop infested boat next spring. Keep birds off your boat this winter with bird control products.